WhatsApp: New update brings Documents Sharing Option in PDF Format. 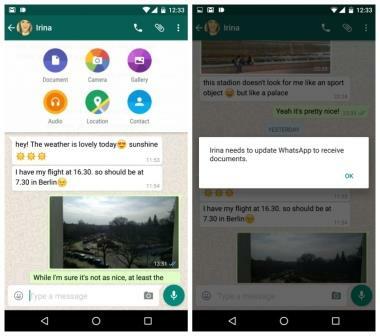 The latest beta version of WhatsApp introduces the first step in sharing documents. With WhatsApp update for version v2.12.493 the user can see a new icon of documents in the drawer of sharing options. For now the only type of documents that can be shared must be PDF files format. As in the image, the appearance of new icon for document led to the removal of another icon. Previously the user had the disposal of both an icon to share photos and one for video, and the latest version of WhatsApp will only be the “camera” option. When using select this option, there may be a small pop-up which will choose whether to capture a photo or record a video. So you can try this new feature to find a friend in your contact list that also have new version of WhatsApp. When done sharing the PDF document it will be able to view a file preview and then will be able to have access to the complete file through a new tab called “Documents“. This new implementation was expected to enough time, and the lack of choice for sharing documents in WhatsApp has already been claimed for a long time by users. Previous articleWhat is the Best Place to Advertise Online, Google or Facebook?